The parish of Caister on Sea is located on the east coast of Norfolk, directly north of Great Yarmouth. During the 19th century it was called Caister-next-Yarmouth and the name was formally changed in 1927. In the late 19th century there was a medium sized village in the centre, but throughout the 20th century the settlement grew considerably and it now covers almost the entire the parish. Great Yarmouth racecourse in the south and the dunes and beach in the east are among the few open areas. 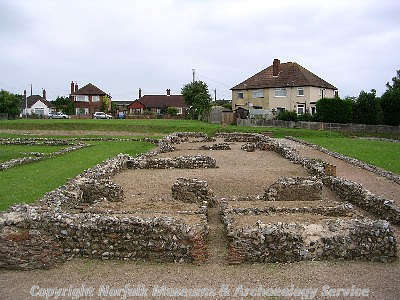 Caister on Sea parish has seen a considerable amount of archaeological work. Since the early 19th century there have been numerous stray finds and many were reported during 20th century building works. During the 1950s research excavations were carried out and more recently excavations have taken place ahead of development. There has been some fieldwalking and metal detecting and quite a few sites have been identified on aerial photographs. As sites have been identified in most parts of the parish, it is reasonably straightforward to draw conclusions about past settlement and activity. Prehistoric flint artefacts have been found on a few sites. Although some cannot be dated any more closely than the prehistoric period in general, many can. These include two Palaeolithic handaxes (NHER 30179 and 38079), a Palaeolithic flake, Neolithic arrowheads and a hammerstone. 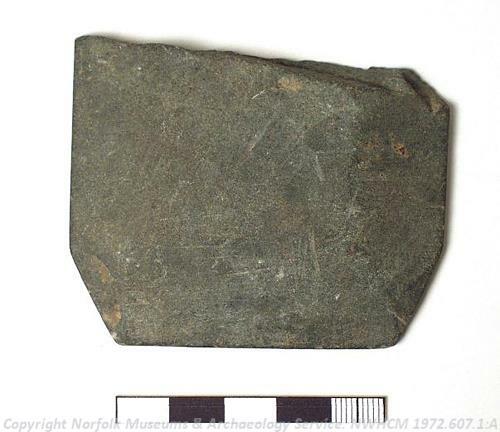 At least one Neolithic polished stone axehead (a second may come from the parish or from Caistor St Edmund), a prehistoric stone axehead and a Neolithic or Bronze Age perforated stone axehammer (NHER 8672) have also been discovered. A Late Bronze Age gold hoard (NHER 8675) and a Bronze Age pit (NHER 35483) have been found in the centre of the parish. Three ring ditches have been identified close by and they could be the remains of Bronze Age barrows. Two further ring ditches located near the Caister bypass may also be Bronze Age barrows, although it is equally possible that they could be Iron Age roundhouses. In 1977 a metal detectorist discovered a hoard of Late Bronze Age copper alloy objects (NHER 12872) on the line of the bypass. Few Iron Age finds have been collected. Those recorded include pottery and a strap fitting. An Iron Age or early Roman field system (NHER 27513) is visible on aerial photographs of the area adjacent to the bypass. Undated cropmarks in the north (NHER 27474), including a trackway and field boundaries, could be Roman. During the Roman period the coastline was very different to that of today. The northern part of the parish was dry land and part of an island, later known as Flegg. The low-lying land in the south, however, was part of a ‘Great Estuary’. This followed the courses of the Rivers Thurne, Yare and Waveney. Estuarine conditions covered much of the area of modern Broads and came within 7km of modern Norwich. During the early 3rd century AD a Roman 'Saxon Shore' fort (NHER 8675) was established on the northern edge of the estuary. This was one of a chain of coastal defences that was designed to counteract the threat of sea-borne raiders (and which also included forts at Brancaster and Burgh Castle). The fort wall and bank enclosed about 3.5 hectares and excavations have shown that they enclosed buildings, a possible corn drying kiln, a water tank and roads. Finds recovered include pottery, metalwork and coin hoards. Some of the artefacts suggest the presence of a cavalry unit. A town or ‘vicus’ developed outside the fort walls and features located within this settlement have been identified to the west, southwest, east and southeast. Streets and enclosures have been noted on aerial photographs to the south and west, with two kilns (NHER 8678 and 8679) recorded to the southwest. 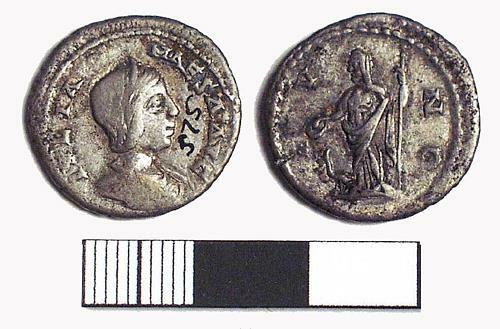 Excavations have taken place in a number of places and have revealed buildings, pits, ditches and a coin hoard (see NHER 12872, 35843, 37421 and 40651). Objects recovered during archaeological work and as stray finds include coins, pottery, tiles, brooches and other metal finds. Cremation urns and a coffin found to the northeast of the fort during the 19th century may have been Roman and could indicate the site of a cemetery. However, the cremations may instead have been Early Saxon in date. The fort appears to have been disused in the late 4th century A.D. and evidence for activity during the subsequent Early Saxon period is elusive. During the 1950s it was suggested that some of the excavated features within the fort were Early Saxon buildings (NHER 8675), although more recent interpretations suggest that this is unlikely to have been the case. The Roman/Early Saxon cremations and part of a brooch (the date of which is uncertain) are the only possible evidence that we have. The fort was a focus for activity in the Middle and Late Saxon periods. At least two Middle or Late Saxon burials have been found within the walls and there was an extensive cemetery of this date to the south and north (NHER 8675). A hollow excavated in the 1950s may have been used during metal working. Finds from the inside or close to the fort include coins and pottery. The assemblage suggests that there was high status occupation and it has been argued that the fort was the site of ‘Cnobheresburg’, a monastery founded during the first half of the 7th century by Fursa. Burgh Castle is another possibility. The settlement was called ‘Castra’ in the 1040s and ‘Castre’ in the Domesday Book of 1086. This Old English name for ‘Roman camp’ is derived from Latin and is a direct reference to the fort. In 1086 King William I and the Abbey of St Benet of Holme were the landholders, with the king holding outlying and associated estates at Martham and Burgh St Margaret. Ploughs, half a mill, meadows, forty five salt-houses, cattle, horses, pigs and sheep were recorded. Medieval features have been excavated in and around the fort (NHER 8675). Medieval objects have been found throughout the parish and include coins, a crucifix and a cannon ball. The medieval church of the Holy Trinity (NHER 8683) is located at the centre of the modern settlement and was probably located in the northeast of the medieval village. It was fully restored in 1894 and in 1967/1968 the foundations of a chantry chapel were discovered outside the north wall. By the medieval period the ‘Great Estuary’ had become marshland. During the medieval and post medieval periods, much of this habitat was reclaimed. The location of a ring ditch (NHER 8689) amongst the former marshes, suggests that this is probably medieval or post medieval in date. The area also features possible post medieval ridge and furrow (NHER 27542), the possible site of a drainage windpump and the site of a windmill. The sites of three further post medieval windmills are recorded. Two were sited to the north of the village (NHER 8693 and 16360), with the third located to the east amongst the sand dunes (NHER 16361). Both The Grange and The Farmhouse are farmhouses located to the southwest of the post medieval village. However, they are now surrounded by modern housing and no longer serve farms. The Grange (NHER 42868) was built in the 17th century, was altered in the 18th century and has 19th and 20th century features. The Farmhouse (NHER 42908) has a mid 19th century range and an earlier back range. Caister House (NHER 42866) is situated in the centre, was built in 1819 and was restored in the 1980s. Caister Cemetery was established to the north of the Holy Trinity Church in the late 19th century and a cemetery chapel was built in 1902. During the 19th century there was a clay pit in the west and in the early 20th century there were sand pits and a railway siding in the northeast. In 1906 Britain’s first holiday camp (NHER 40816) was established on the site of the present Caister Holiday Camp. It originally consisted of tents, which were later replaced by 'huts' and then former tram carriages. A large water tower (NHER 40218) was built during the 1930s in the northeast and at the time it was the largest of its type in Britain. It is probable that during World War One efforts were made to protect Caister on Sea from invasion. An earthwork visible on 1940s photographs in the dunes could be a World War One slit trench (NHER 27568). The parish was heavily defended during World War Two, with military sites located throughout. Anti-invasion defences were located along the entire length of the dunes and beach and included barbed wire obstructions, beach scaffolding, silt trenches, pillboxes, possible anti aircraft batteries and at least two camps. There was a coastal battery (NHER 32675) to the south, with most of it located in Great Yarmouth parish. Behind the first line of defence were, several spigot mortar emplacements, a searchlight battery, pillboxes and at least four camps. Three of the camps were requisitioned holiday camps, and two appear to have been used in July 1944 to prepare troops and equipment before they travelled to mainland Europe to support the invasion (which had begun in June 1944). Air raid shelters were built in at least thirteen different locations. Bombs were dropped on Caister on Sea and bomb craters are visible on 1940s aerial photographs at eight different sites. David Robertson (NLA), 27 February 2006.